This is a fast cozy murder and a clean read. It is entertaining. 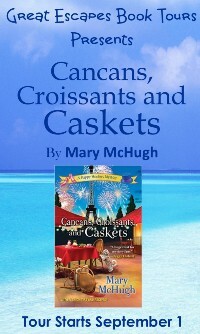 I will read more books from Mary McHugh in the future. I like how each book is told from a different Hoofer’s perspective, which lets the readers get to know each Hoofer a little better. Not much dancing takes place in Paris, but oh the food! 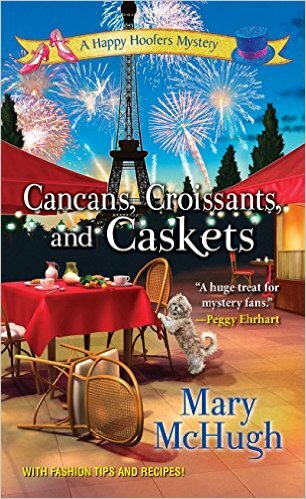 Sprinkled liberally through the book are recipes so good I believe I gained a few pounds while reading this mystery. A very entertaining read with some tempting recipes and some amusing travel tips are included throughout the book. I love this series, and this book just cemented that opinion for me. All the characters are fun and whimsical, the story line is addictive and a total page turner, This book has everything a reader could ask for and more: there is humor, mystery, romance, friendship, a wonderful setting and cute recipes. It’s Bastille Day in Paris. The Happy Hoofers—Tina, Janice, Pat, Mary Louise, and Gini—are all set to kick off the fete by dancing the cancan on a beautiful sightseeing cruise down the Seine. As the leggy ladies soak in the magic of the city of lights, everything is magnifique…until a very important patron goes belly-up on the top deck. Mary McHugh graduated from Wheaton College in Norton, Massachusetts, with a B.A. in English literature and studied at the Sorbonne in Paris. She is the author of the first two books in the Happy Hoofers series, Chorus Lines, Caviar, and Corpses and Flamenco, Flan, and Fatalities; 19 nonfiction books; and two other novels. She was a contributing editor for Cosmopolitan, an articles editor at Woman’s World, Travel Holiday, and Bridal Guide, and has written articles for The New York Times, Good Housekeeping, and Family Circle. She loves to tap dance and to travel—two passions that inspired her to write the Happy Hoofers series. She lives in the New York area. Great giveaway. One book is great, a stack of books, wow.